The footage of Mark Zuckerberg appearing before the Senate Judiciary and Commerce Committees begins with the Facebook founder shaking a couple of hands and taking his seat. As he moves, a shifting wall of photographers moves with him. When he sits, they assemble in front of him, a dozen cameras only inches from his face, while he looks glassily ahead. It’s all soundtracked by the rapid fire of shutter snaps. This picture of invasiveness was particularly arresting as he was primarily there to defend his company against a charge of failing to protect his users’ privacy. In a further twist on the privacy theme, two pages of his notes were captured by high-res photography, allowing for widespread analysis of his team’s strategy for the hearing. The subtext was clear: Look, we just made the platform. You’re the ones who filled it with propaganda and hate speech. I’m sorry you can’t be trusted to play nicely. Interestingly, this statement also sought to elide the platform’s role in sharing user data. In Zuckerberg’s summation, it’s the users who have “control over their data” and choose to “share it” with developers. However, the Cambridge Analytica scandal showed quite clearly that users – at least during that stage in Facebook’s history – did not have control over their personal information. The people who took the personality quiz that allowed Aleksandr Kogan to scrape data from the site were likely unaware that they were also serving up their friends’ personal information. Moreover, the non-quiz-taking bulk of the 87 million users whose data escaped the platform had no idea that the breach had even occurred. Not much choice, even less control. Part of the Facebook team’s strategy was to depict the platform’s use of personal data as limited and safe. 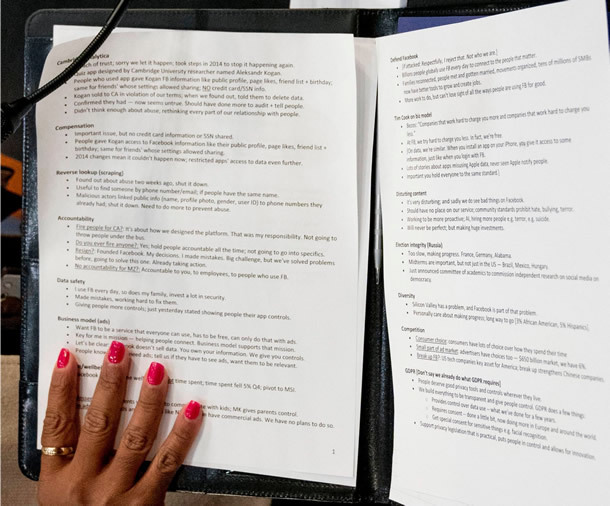 Photos of Zuckerberg’s notes for the hearing showed the following prompt: “Let’s be clear. 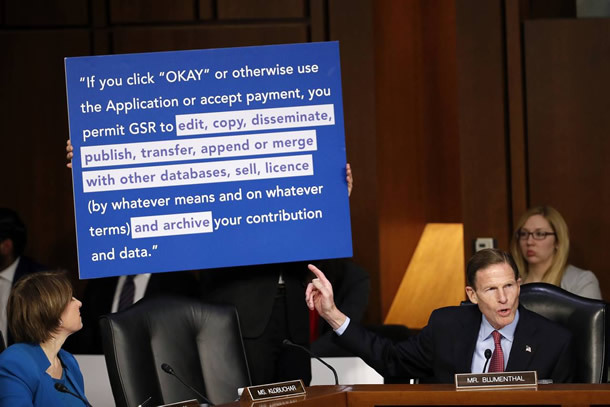 Facebook does not sell data.” He attempted to push the narrative that Facebook only helps advertisers reach particular markets via targeted ads on the platform. His anodyne example was a skiwear company trying to connect with women skiers. It’s an example that’s hard to find fault with – what skier would be offended at seeing skiing products on their feed? – particularly as Zuckerberg claimed the backing of research proving that if people have to see ads, they prefer to see them for relevant items. Zuckerberg went on to admit that Kogan had sold the data to firms other than Cambridge Analytica. So, to recap: Facebook does not sell your data but it gives access to people who will? Or it did, but it no longer does? It’s not entirely clear. What is clear is that Facebook would like to characterise this as an isolated incident, but since Mark Zuckerberg claimed he can’t remember seeing Kogan’s terms of service, how would he know?